Welcome to Crowley, Hoge & Fein, P.C. Crowley, Hoge & Fein, P.C. is a general practice law firm that meets the legal needs of individuals as well as medium and small-sized business. Founded in 1975 by Daniel H. Crowley, the firm is held in high regard by clients, judges, and lawyers alike for excellence in legal services. Over the years the attorneys have been involved in many notable cases in the District of Columbia and Maryland. 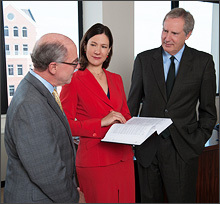 Unlike many Washington area law firms that specialize primarily in one area of the law, Crowley, Hoge & Fein can handle most legal problems an individual or business may encounter. The firm provides competent, thoughtful representation that helps achieve client goals at a reasonable cost. The clients of Crowley, Hoge & Fein receive close personal attention and are assured legal representation of the highest quality, with the maximum chance of success. Contact Crowley, Hoge & Fein, P.C. Family Law relationships are governed by law. People are often in need of legal assistance to establish these relationships, for instance, when entering into the premarital agreement, adopting a child or changing a name. Legal advice is necessary, too, when relationships break down. When marriage ends, for example, questions of financial support, child custody and division of property must be resolved. Careful planning is required to assure that in the event of incapacitation or death, a person’s decisions and intentions will be reliably and competently carried out. When people can no longer take care of their own affairs, court-appointed individuals may make decisions on their behalf, manage their assets or administer their estates after death. A “Tort” is a civil wrong or act causing injury to a person or property in which the wrongdoer typically is liable for money damages. Examples might include medical malpractice or negligence by the driver of a motor vehicle. Every tort case addresses three issues: Has a person violated the rights of another? Has the other party suffered injury? Is the negligent party able to pay damages through insurance or other sources?